Piano lesson books for adults are quite popular and there are several reasons for this popularity. Some people have always longed to learn to play an instrument but did not have the opportunity when they were young. Others did begin some type of music lessons, but let them fall by the way, and now want to pick them up again. Still others simply want to learn something new, and decide that learning to play a piano or keyboards would be an interesting pastime. Whatever the reason for wanting to learn to play the piano or keyboards, many adults prefer to learn on their own time, and so look for piano lesson books that can teach them what they need to know, without making them feel like a child. Morty Manus is the president of Alfred Music Publishing company and the author of the Teach Yourself To Play Piano. This book is designed for those adults who want the joy of being able to learn and successfully play the piano or keyboards. This beginner piano book for adults has all the right features to get you playing your first song quickly, while learning all the necessary skills that you need to read music and play with both hands. The Alfred’s Teach Yourself To Play Piano has everything that almost anyone would need to learn to play piano or keyboards on their own. The lessons are well structured and complete, teaching both how to read and how to play music. The step by step lessons, the warm up scales and other features make learning how to play fairly easy, even for someone who has never played a musical instrument before. Reviews for the Teach Yourself To Play Piano book are excellent, and most of the consumers who purchased this book, really felt that it was laid out in a way that made learning both simple and fun. The one major complaint about this book is that it does not stay open while trying to follow the lesson and play without using some type of clips. Other than that, most people found this an ideal beginner book and felt they learn a lot from using this on their own. The Alfred’s Basic All-In-One Course Book 1 is another adult piano book by Morty Manus, along with William A. Palmer and Amanda Vick Lethco, all under the umbrella of Alfred’s Music Publishing company. Like the “Teach Yourself to Play Piano” lesson book, the lessons in this book are geared more towards adults who want to learn how to play the piano. The Basic All-In-One Course Book 1 has some great features that will help make learning to play the piano and keyboards both simpler and more fun. 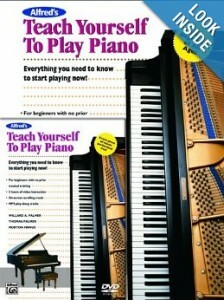 This basic lesson book is the first in a series of books that can help you learn to play the piano or the keyboards. There is a mix of drills and exercises and actual songs, as well as written lessons so that the learn-on-their-own student can really get involved with learning. Not only will you learn how to play the piano, you will also learn a lot about reading music and music theory as well. Reviews for Alfred’s Basic All-In-One Course Book 1 are very positive. It seems that both those people who are taking formal piano lessons, as well as those who are learning to play the piano on their own, find this book helpful, and it gives them a positive experience while learning to play. However, some customers feel that this Basic All-In-One Book does not teach you enough of the left hand chords, and that the songs in the book are somewhat juvenile for adults. It is clear that while most customers felt this book was an excellent teaching tool, it really depends on your individual learning style. John Thompson is both a musician and composer and he has designed a number of books for those wishing to learn how to play the piano. His books have been used to teach thousands of people, from children to adults, to play the piano or keyboards. The Modern Course For The Piano: First Grade Book is designed for those who already have some familiarity with reading music, and know at least some piano fundamentals. The Modern Course for the Piano book makes learning how to play the piano with both hands interesting and fun. Once you have become familiar with the different notes, the basics of reading music, and simply picking out tunes on the piano and are ready to start playing with two hands, John Thompson’s Modern Course for the Piano seems to be a good choice for improving your playing skills. Although this book is designed for children, adults who are teaching themselves to play the piano will benefit greatly from the lessons in this book and other in the series. Reviews for this beginning piano book are excellent, with many of the reviews across the web written by people who had used this book as a child and remember how useful it was to them when first learning to play the piano. Some of these previous users are now using the book to teach their children, while others are using it to refresh their own playing skills. Overall, this beginner piano book brought back positive memories from people who had used it when they were young, and new customers found it exceptionally helpful. Both Nancy and Randall Faber are talented musicians and music teachers with over 200 publications for piano. Their Piano Adventures Lessons Book Primer Level, and their Adult Piano Adventures All-In-One Lesson Book One, are two of those publications, both of which are included in this review. The Piano Adventures Lesson Book: Primer Level has just the right features for students of all ages to learn to play the piano, whether they are taking lessons or learning on their own. The Piano Adventures Lesson Book: Primer Level seems to be the ideal book for anyone wanting to learn how to play the piano without having had any previous knowledge. The book allows students to learn a skill and then builds upon those skills to learn the next skill and the next. Reviews for the primer level piano book are excellent. While this book is designed for young children, it can be used by adults who have no musical background to learn the basics of piano playing. While most of the reviews are written by parents of children who are taking piano lessons, there are some adult reviews for this book across the internet. Yes, it will seem simplistic to some adults, but for others it will fill in the basics that are important to learn. You will likely complete this book in less time than you would expect. The Adult Piano Adventures All-In-One Lesson Book by Nancy and Randall Faber is a lesson book designed primarily for adults who want to learn to play the piano. The Adult Piano Adventures All-In-One Lesson Book 1 is a well laid out and easy to follow lesson book for adults wanting to learn to play the piano or keyboard. The lessons are broken down into manageable chunks, and you can spend as much time as you need learning one skill before moving on to the next lesson. Most of the consumers who purchased this book and used it, found that it was indeed helpful in their learning to play the piano. Most customers liked this lesson book so much that they plainly stated that once they completed all the lessons in Book 1, they planned on moving on to Book 2. If you are planning to learn how to play the piano or the keyboards, and you are looking to teach yourself or add to your lessons, then perhaps one of these piano lesson books for adults will help you to learn the piano in less time than you might have imagined.